Character Breakfast ALL YOU NEED! Helpful sign up sheet for the character breakfast. 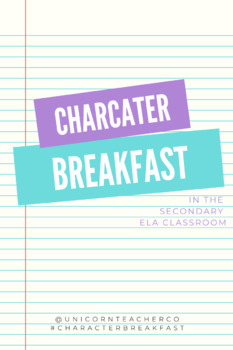 This is the full 10+ day lesson plan outline for my Character Breakfast project. Individual assignments sold separately. This is ALL of my Character Breakfast resources which I use at the end of every year. The Character Breakfast allows students a deep level of introspection, reflection and character analysis. This is a project based learning party that asks students to take on the role of one of the characters from one of the books you have read throughout the year.